I am really excited about the second part of this guest post I have for you today from my buddy Justin Williams from “House Flipping HQ”. This post is so comprehensive and just plain awesome, that I am going to post this in two parts so you have time to really soak it in. Understanding how to hire your dream house flipping assistant is something every real estate professional should know how to do. However in reality, most of us aren't very good at it. Justin has built a “hands off” business model that allows him to flip about 100 houses a year. He has managed to do this by creating systems and by hiring the right people. Hiring the right people is what this post is all about. If you missed part 1 of this 3 part series, you can read that by clicking here…. If your dream is to be able to have passive income without venturing into “landlord hell”, then this series of posts has been written just for you. Last time in Part 1, we determined the role you want to focus on in hiring your new assistant. Now it is time to actually hire them! Yes that’s right! 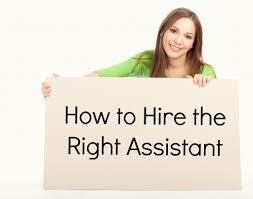 In this post I’m going to teach you how to actually go about hiring your new assistant! Now, the actual place you either post your ad or mention you are looking to hire someone is actually much less relevant then how you go about hiring them. For example when I hired my assistant, Vanessa, I used Craigslist (www.craigslist.org). When we hired Jessica (Vanessa’s cousin) it was through a referral. Finally, we hired Kale (my recently-hired acquisitions coordinator) who “found” me when I made an announcement on my podcast about the position. I was actually somewhat familiar with Kale from church when he sent me an email expressing his interested. On my podcast I have interviewed people who have hired their assistants from newspaper ads, and someone else who even swears a temp agency is the way to go! The point I want to make is that where you search for your assistant isn’t as important as their qualifications and how you bring them in to your organization. Don’t spend too much analyzing where you’ll find them, and focus more on the stuff that matters most. So, let’s look at a specific example with a step-by-step approach of how I hired my rock star assistant, Vanessa (yes, the one who runs my entire house flipping business for me!). First, I ran an ad on craigslist stating that I owned a real estate investment company and was looking for a part time assistant who could help me with some of the day-to-day administrative tasks in my business, as well as help make offers and acquire investment properties. I mentioned some of the basic skills I was looking for, such as someone who was “hard working”, “motivated”, had “good communication skills”, etc., but then I also mentioned that they needed to know how to use the MLS. Oh, and one more (very important) thing is that I stated they should be very good at taking constructive criticism. (More on this part in a moment.) Finally I said the pay would be between $11 to $14 per hour with potential performance bonuses. Okay, so let’s break things down a bit because there are a lot of important items that I just mentioned. First, I mentioned that I was looking for someone “part time”. This is very important if you are hiring your first assistant because this is the person who will take a LOT of your time and energy to train (not to mention frustration) before they even come close to adding value to your company. By hiring part time and working up to full time, you allow yourself to still take care of your responsibilities with your business and then train them on the side. Otherwise, if you start someone out full time, you’ll end up spending 40 hours a week training them and nothing will ever get done! This will also save you overhead expenses as your employee is still learning the ropes (as opposed to contributing to productivity and the bottom line). I mentioned before that the person MUST be able to take constructive criticism. In fact, this has become the #1 quality I look for when I work with anyone, whether they are a new employee, agent, and contractor or … well, anyone. I have found that most people actually have a REALLY hard time with this! Many people have a very hard time both being willing to accept constructive criticism and being willing to give it! The bottom line is if you can’t give feedback to your assistant there will be no progression! And if you don’t give it then how can you expect them to know what is expected? And if they won’t accept it without getting offended or upset then how are they going to learn and grow? It is not so much a matter of someone being right and someone being wrong. It is your company and you have a way that you want things done and you need them to do them in that way. You don’t want to be a micro-manager, but you need to be able to tell them you want things done in a certain way and they need to be able to work towards that vision. Over time, as they actually know what they are talking about, they will be able to implement more things on their own (with your approval, of course) and provide more help developing your actual processes and systems. But the most important thing is that they need to be “teachable” and you need to be willing to teach them. Otherwise how can they become the “rock star” assistant you are looking for? Justin Williams is a professional real estate investor and house flipper who, for the past 7 years has built his systems and business to around 100 deals per year, all with minimal involvement from himself. Currently Justin is helping educate others and share his knowledge through his website and podcast, available at www.HouseFlippingHQ.com. These are just awesome articles. Keep them coming. You have opened the door for a whole lot of folks to be able to do the same thing. Great information!